Driving into Florence from Siena on a Sunday afternoon in the midst of a sports car rally beginning in Siena, any man or woman could not help but be impressed by the Italian sports car legends of Ferraris and Lamborghinis. However, as I arrived at the Florentine Baroque hotel Boscolo Astoria, the steady rains began. The rooftop terrace offered spectacular city views…especially the famous Duomo. I was able to find a spot under cover to ponder this towering ancient structure impressing upon the Florence skyline. You may notice tourists gathered around the top of the dome and campanile with a rain soaked bird’s eye view of the famous city. 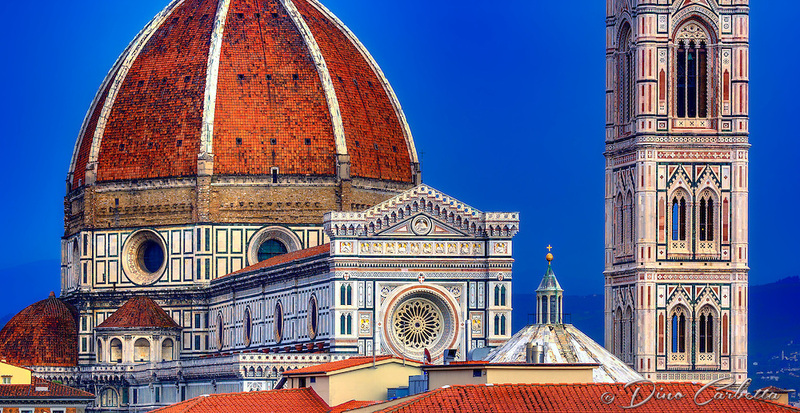 This image is a combination of three horizontal images combined to create one very wide panoramic close up view of the Duomo’s bellissimo facade.